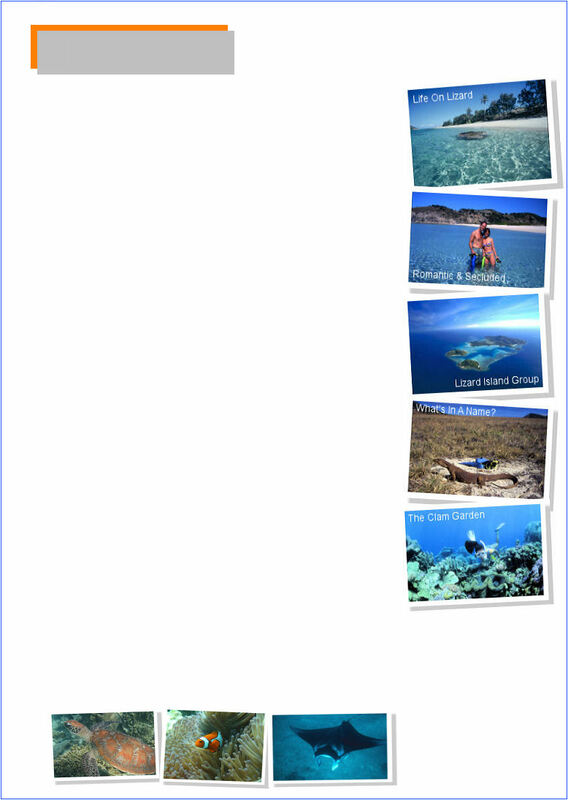 ABOUT LIZARD ISLAND Lizard Island is considered one of Australia's most exclusive destinations. Lizard Island is situated 132 nautical miles north west of Cairns Queensland. The island covers an area of 1013 hectares and is surrounded by some of the most beautiful and pristine reefs in the world. These reefs are absolutely teeming with marine life - several species of clown fish, green turtles, giant clams, rays, amazing coral formations and hundreds of species of colourful tropical fish await you at Lizard Island. 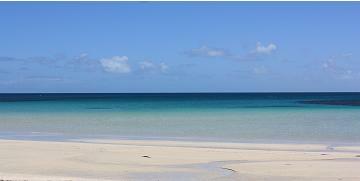 Lizard Island boasts 23 pure white beaches. Lizard Island is the ultimate remote Great Barrier Reef experience. For those wanting to visit the Great Barrier Reef in Australia - it does not get any better than Lizard Island. THE TOUR Your special day begins with a complimentary hotel transfer to the Daintree Air Services terminal at the Cairns International Airport. Your low level scenic flight to Lizard Island will depart at 8am - all clients booked on this tour have a window seat to take full advantage of the scenery while flying low level along the World Heritage listed Rainforests and over the Great Barrier Reef Marine Park. Experience unique views of the world heritage listed wetlands of the lower section of Cape York Peninsula as well as exciting aerial views of Port Douglas, the Daintree Valley, Daintree River, Cape Tribulation, Bloomfield, Cooktown, the Endeavour River and the Silica sands of Cape Flattery, to name just a few. Once on Lizard Island you have a full six hours to explore this pristine national park. Client's booked on the Lizard Island Day Tour can choose to spend the day completely alone relaxing on a secluded beach, or enjoy the company of the tour guide and small group. The day is yours to do as you wish - snorkel the world famous Clam Garden, relax under the Casuarina trees at Watson's Bay, take a walk to the Blue Lagoon - voted World's Best Remote Beach by New York's 'Details' magazine - or keep busy and do all of the above. There are also many bush walking tracks to places such as Cook's Look and Chinaman's Ridge. Whatever you choose to do at Lizard Island, you can be sure to have a most memorable day. LIZARD ISLAND HISTORY Lizard Island holds great historical significance concerning both Aboriginals and Europeans. Ltd James Cook, along with Sir Joseph Banks, named the island 'Lizard Island' after discovering many large sand monitors upon their first visit to the island. Just over 100 years later the island was inhabited by beache-de-mer fisherman. Watson's Bay on Lizard Island is named after one of these fisherman. The story of the escape of Watson's wife through the Great Barrier Reef from Lizard Island while sitting inside the cut-down boiler from a sunken ship has become one the most prominent tales of folklore from the pioneering era of Australia's history. YOUR SAFETY AND COMFORT Weather conditions change quickly in Tropical North Queensland. In the event of poor weather Daintree Air use only multi-engine air-conditioned aircraft for the Lizard Island Day Tour. These aircraft are capable of flying through and/or above bad weather enroute. Once on Lizard Island we provide flotation devices for those not so comfortable snorkelling. We also provide stinger suits. The above safety gear and suits are provided free of charge. BRING ALONG: Hat, towel, sun protection, bottle of water and a dry change of clothes. Lizard Island Update In April 2014 Lizard Island was in the area affected by Tropical Cyclone Ita on the east coastline of Australia. The Island was subject to stong winds, heavy rain and large tides. As expected there are trees which have fallen, leaves removed from branches and a bit of sand washed onto the paths. The would famous reefs. nemo garden and clam garden were spared any damage. Daintree Air has been going to Lizard Island for over 35 years and were on the gound the day after the cyclone. Since then the Daintree Air team have been back and forth to Lizard Island on charter and day trips where they have been walking, swimming, snorkelling and enjoying the natural beauty of the national park and reefs. Now after several months the island is thriving again and the marine life are back better than ever. 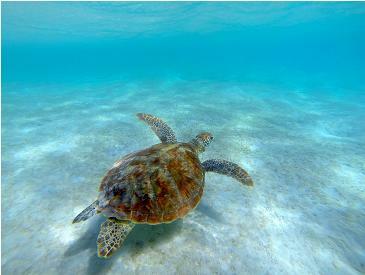 As pictured above the Daintree Air team on tour were swimming with turtles just off the beach in Watsons Bay in August. Lizard Island Day Tours are running on demand and the Daintree Air Team would love to take you for an amazing day. For more information Click Here or the link in the page below. Terry the Turtle I Picture taken by Daintree Air Team while snokelling at Lizard Island in August 2014.